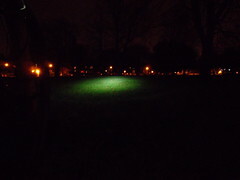 This is a review of the Hope Vision 1 LED. 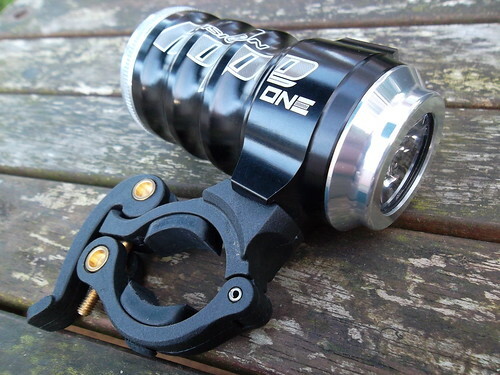 It is not the most powerful front light available, it seems to be overpriced, it switches off without warning, its quick-release clamp has a number of detractors, and some have called the light ugly. So why should you have one? The light has a stated weight of 110 grammes. However, that figure is made considerably greater with the addition of batteries. Four AA 2700mAH Ni-MH batteries (recommended by Hope) are heavier than the light and bracket combined. Although I didn't find the weight too troublesome when fastened to my helmet I didn't use the light for extended periods. 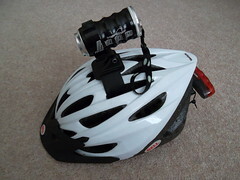 To go by the comments of the majority of reviews the consensus seems to be that the Hope Vision 1 LED is too heavy as a helmet light. 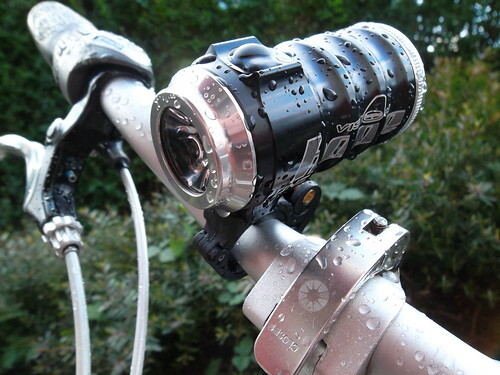 The quick release bracket divides reviewers of this light. Allowing for the fact that if you have bikes with standard and oversize handlebars you will have to fit a shim of some sort on your narrower bars (you have to fit either the standard or oversize handlebar sleeves), I see the quick release clamp as a positive thing; if like me you have five or so bikes it saves having to buy four more mounting brackets. The clamp – with its reassuringly sturdy brass bolt – easily unclips and if you only use one style of handlebar there is no need to even turn the lever clamp once it has been set up correctly (see this You Tube video made by someone in response to grumbles about the bracket). The reason the light and quick release clamp come off the bike as one unit is that the two are held together by an M5 x 12mm bolt with a small rubber 'O' ring between them. This gives a stated maximum of 20 degrees of horizontal adjustment, but be aware that the bolt will need to be tightened firmly or it may soon become loose. Good luck with getting those rubber bungs in place. Hope Technology promote their claim that the gear they sell is made in Britain. You can watch this promotional tour of their new factory to see how their CNC machined gear is produced in Barnsoldwick. The same cannot be said of the weakest link in the Hope Vision 1 LED – the battery holder. It's made in Taiwan and is nowhere near as robust as the rest of the light. Some reviewers have complained about this and the fact that there is no locating groove to make sure that the battery holder is in the correct position. In practice it only takes a few attempts to get the holder in to the body of the light. If the beam is angled down (recommended) the plastic holder should fall in to place – there should be no need to force it in to position, even allowing for the marginally thicker girth of rechargable batteries that most users will want to fit. Unlike the other lights I own the Hope Vision 1 LED does not display a white light to the side for other road users approaching from left or right (it is consequently the shortest of the four front lights I own, and explains its stubby appearance). This perhaps reflects the company's main market of off-road cyclists. 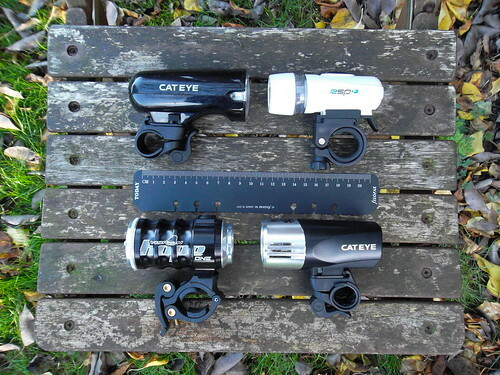 There has been some discussion on cycling forums on whether lights like these – and especially more powerful ones – are even legal on UK streets. 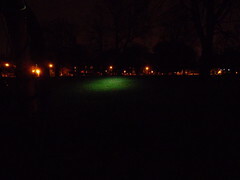 Some, such as this one, don't have a beam cut-off at the top of the light. This is not required or even desirable off road, but unless the light is angled down considerably it may easily dazzle other road users. A feature of the Hope Vision One LED is that it will switch off when there is no longer enough charge in the batteries to power the light at that particular setting. This is bad enough out on a country road, but in an urban setting you may be riding without a front light for some time before you realise. Perhaps you may have an ancilliary light permanently on (after all, I imagine few cyclists would buy this as part of their starter kit), but that rather defeats the object of having such a bright light up front. One of the symbols on the instructions for the Hope Vision LED 1 illustrates what is meant by this "regulated light output". It looks a bit like the path of someone travelling along the flat and suddenly falling off the edge of a cliff. Which is something that particularly unfortunate cyclists may find themselves doing if a brightly illuminated night time ride turns pitch black without warning. You do get further run time on a lower setting if the light turns off from a higher setting, but you have to manually switch on to the first and lowest setting for this to happen. It takes a few seconds. I keep a spare battery holder (and a spare spare from Maplin, £1.19) loaded with a fresh set of rechargeable batteries just in case. The aesthetics of this light are not to everyone's taste. I must admit when I first saw one I was reminded of those little canisters they used to have in department stores (were they for till receipts? ), but the look grew on me. The scalloped body is supposedly so designed to act a heat sink, but I can find no confirmation of that on Hope's web site. My light also has what appear to be five blobs of glue holding the lens in place, but it's not something that keeps me awake at night. I finally gave in and ordered this light on behalf of Father Christmas. After being dragged along during a one-day coast-to-coast cycle ride and another one-day ride of the Yorkshire Wolds Cycle Route, both of which finished in the dark, I was ready to upgrade. The clincher came after Patrick steered me home at the end of a cycle ride in Lincolnshire (read his own Hope Vision 1 LED review here). On all three occasions I would have been in trouble had I relied on my own set of lights. My partners for those rides, Steve and Patrick respectively, both have a Hope Vision 1 LED front light. Now so do I, and I'm glad about it. Posted by Chris on December 11th, 2011. I'm surprised you only gave it two and a half stars for value for money when it is one of the less expensive powerful lights. I've said before that I think a good light is money well spent, you really can't put a price on being able to see properly. I don't do a great deal of night riding but having a good light makes it a pleasure rather than a nightmare. I got mine a pound cheaper than Patrick paid, and he only gave it two stars! Actually, I'm basing it on the RRP, and I can't ignore the cost of batteries (and spare batteries) and the fact that I am quite tight. A good review. The night time photos and size comparison are very well done. I like the quick release bracket and although the battery holder seems flimsy I wonder how many actually get broken. Not many I suspect. It does its job. I've also bought a spare, loaded with Energizer Lithiums. I like the styling of the light and use mine as a household torch as well as for cycling. I'd buy one again, and not just because it's Made in England. [Added later] I like the tree bark photo too. I have a bejasus of a light for the last few years, though I haven't used it for a year as I've been semi-retired so cycled during the day in winter. The Cateye Triple shot. 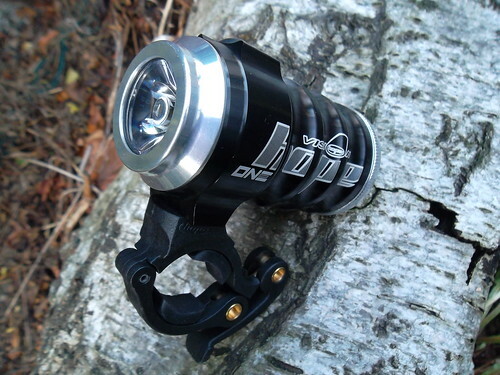 It's like a motorbike light. If you haven't used it for ages it's reluctant to charge. Just keep unplugging and starting again and you'll get it charged. This is not in the instructions but I worked it out by trial and error. I've had other powerful rechargeable Cateyes before this, but this one is the best. ...although the battery holder seems flimsy I wonder how many actually get broken. Not many I suspect. Fair point, Patrick. It just seems so obviously less durable than the light it fits in. Worth getting a spare or two, especially for barely a quid from a shop in town when the official spare battery holder has a RRP of £5.00 (and I would have to register on yet another cycling web site and probably pay for a delivery charge, too). Yes, that's a good review. I'm not fond of large expensive lights with quick-release. I need to remove the light and put it in a large pocket (where it will fall out) or open a bag (if I have one, and it will be raining). Brown Bike's larger front lights (from Eurolight) have bar clamps that need a Phillips screwdriver. The lights then attach to the clamps, needing a key to attach and remove. When the light is on, there is no access to the screws. I leave the lights on permanently. I don't suppose the keys are highly secure, and the lights are cheap and not very bright so not worth nicking, but a dim (sorry) thief might not know. 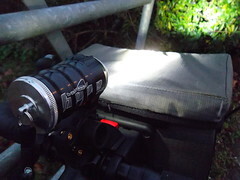 Good review but the weak point of this light is the clamp – on my narrow section bars it cannot be tightened enough to prevent the light drooping. I think the problem is the interchangaable rubber nut thingys. Like any clamp, staying in place relies on friction and there is insufficient contact area between the bars and the rubber nuts. I've had this light a week and today was the last straw – it was raining and the water was obviously acting as a lubricant between bars and rubber nuts and the light just would not hold in place (this was on the road so no major vibration). For 80quid I expect it to work straight from the box without faffing around with shims and bits of old innertube packing -its going back to Evans tomorrow we'll see what their refund policy is like. I agree that it is friction keeping (or not keeping) the light in place on the handlebars. I have never had any problems using the large pair of bungs on a variety of narrow bars in all weathers. Perhaps a faulty clamp – or maybe it's not being tightened enough before the clamp is snapped in place? Hope Vision 1 LED (2012) reduced to £54 at Wiggle – Gunsmoke only at the time of writing. Apparently, there is a pricier 2013 version out – not yet reviewed – with a "new low battery warning mode to alert the user approximately 30 minutes prior to the shutdown of the lamp." 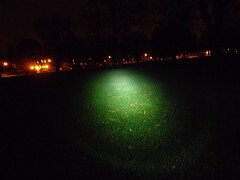 Lumen output is increased by a reported 35% to 215 measured lumens, 300 generated lumens.